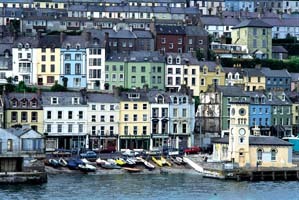 Cobh, Ireland is a picturesque seaside town located in County Cork along the Emerald Isle’s southeast coast. Neat rows of homes spill down the hilly terrain, culminating in a Georgian-style downtown area that fronts Cork Harbor. This was once Ireland’s busiest and most important port, a harbor used by military vessels and an average of three transatlantic vessels each day. You won’t find Cobh (pronounced Cove) on the itineraries of most Americans traveling to Ireland, despite the fact it's only 30 minutes from the lip-worn stone at Blarney Castle — one of the world’s most popular tourist stops. And yet, the quaint town is connected to three major events in U.S. history. Not only was Cobh the port from which 2.5 million Irish left their homeland on ships bound for the United States and Canada between 1845 and 1960, the town has a poignant connection to two of the world’s greatest sea disasters: the Titanic and the Lusitania. As I stood on the dock where the emigrants boarded the waiting ships those many years ago, I gazed up at Cobh’s steep, winding streets, a scene which has changed little in over a hundred years. This would have been the Irish emigrants’ last glimpse of Ireland. The country had been devastated by the Potato Famine of the mid-1800s, when hundreds of thousands of people starved. Still, it was Ireland. Their Ireland. Most would never see it again. Thus, for decades the city became synonymous with farewells. Cobh’s most famous emigrant was named Annie Moore. On January 1, 1892, 15-year-old Annie was the first of 700 people to disembark from a ship and be processed at the newly opened Ellis Island. 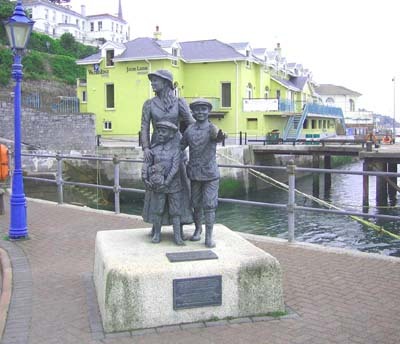 A bronze statue of 15-year-old Annie Moore and her two young brothers sits adjacent to the Cobh Heritage Centre. A second bronze statue of Annie Moore was constructed in New York on the second floor of the Ellis Island Immigration Museum. The statues serve as a moving reminder of the millions of Irish who came to begin new lives in America. On April 11, 1912, the streets of Cobh, then called Queenstown, bustled with street vendors hawking their wares. Shops held special sales for the throng of tourists who had come to town, while hotels, restaurants, and pubs were filled to capacity. The entire town was ready for arrival of a brand new ship, the Titanic, hailed as the world’s largest and most luxurious ocean liner. The monster ship glided into Cork Harbor, anchoring shortly before noon. Porters scrambled to get trunks and suitcases transferred from the local hotels to the waiting tenders for transport to the Titanic. Bags of mail and loads of cargo were taken from Cobh’s docks and packed into the ship’s belly. The excitement was accompanied by the local pipe band, which played lively tunes that seemed to add to the city’s festive mood. Before boarding a tender, passengers lined up along the quay to be interviewed by a U. S. Consul Representative, and to have their eyes examined for trachoma by an American doctor, a mandatory regulation in those days. Meanwhile, reporters and photographers from all over the country were on board the grand ship. There were interviews with Captain Smith and other principal officers. Members of the media were given tours and allowed to take pictures. These would be the last photographs taken of the floating palace, her crew and passengers. That afternoon, the tenders returned from the Titanic with the members of the press. The Titanic pulled up her anchor and steamed towards the Atlantic Ocean and her ill-fated date with destiny. Nearly a week later, word reached Cobh about Titanic’s tragic sinking. Family members who had said good-bye to loved ones boarding the ship just days earlier streamed back into the seaside town, as if that would somehow make the impending news of the passengers’ fate easier. When the news arrived with the names of the dead, grief swept through town. A memorial service for the victims was held at St. Colman’s Cathedral. Although not everyone who boarded at Cobh was Irish, the loss was felt all over the country; especially in Cobh. Almost exactly three years later — in May of 1915 — 1195 souls perished when the Lusitania was torpedoed by a German submarine off the Irish coast on its way to Cork Harbor. It was a beautiful spring day and picnickers on the promontory point known as the Old Head of Kinsale watched the magnificent ship steaming along the coast of Cork. Suddenly, there was a huge explosion. The mighty ship lurched. A moment later, fiery smoke belched into the sky. There was a second explosion, and the ship quickly listed. The small audience that was perched on the cliff watched the horror unfolding before disbelieving eyes. Eighteen minutes after the first explosion, the Lusitania slid beneath the cobalt blue water. Word quickly spread to villages along the coast. Every available boat, dory, and dingy was launched in an effort to rescue survivors. Even though it was spring, the deep water was icy cold. Hundreds who had escaped the explosion and fire died of hypothermia. The lucky few who survived numbered 764 men, women and children. Victims of the tragedy, both dead and alive, were taken to Cobh. Bodies were lined up along the waterfront until they could be identified. The hospital was overwhelmed, as were the hotels in both Cobh and nearby towns. Cobh’s resilient residents volunteered to take the overflow of passengers into their homes as long as necessary. Hundreds of corpses were never claimed. 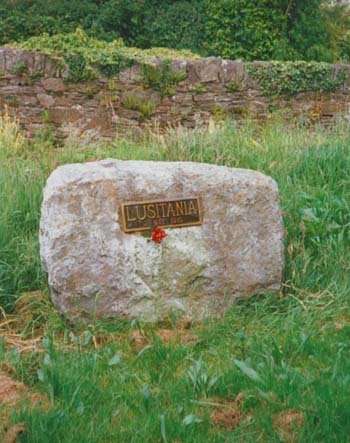 Massive communal graves were dug at the Old Church Cemetery on the edge of town, marked only with a stone bearing a plaque reading, “Lusitania, May 1915.” In some cases, individual plots were purchased by the next of kin. The cemetery is about 10 minutes from downtown Cobh and well worth a visit. The survivors who weren’t injured badly sat together in the pews at St. Colman’s for the special memorial service honoring those who had perished, an event that mirrored the observance held for the Titanic in the same place. Photographs by Colleen Fliedner, unless otherwise indicated. 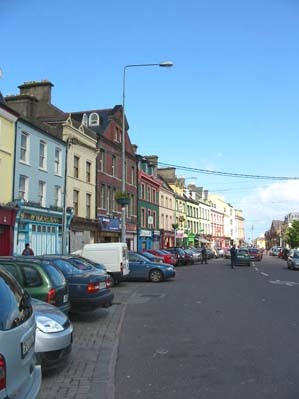 While in Cobh, I stayed at the Commodore Hotel, located smack in the middle of town. The suite was furnished much as it would have been in 1915, with apricot silk drapes, bedspreads, couches, and wall coverings. Chairs and tables were gilt gold and marble. The view from the window offered a sweeping view of the boardwalk, docks, and harbor. I wondered if wealthy passengers waiting for the Titanic had occupied that beautiful hotel room. Lusitania survivors had. In fact, I was told that paying guests staying in the biggest rooms voluntarily vacated them so that rows of beds could be set up in hospital fashion for the emergency. And the cause of the explosions? Germany was at war with England and had repeatedly warned that they would torpedo any ships transporting munitions to Great Britain, including those carrying passengers. Apparently, no one took their threats seriously, and thousands of innocent lives were lost as a result. Not only was the world outraged, America was thrust head-first into World War I. Today, there are memorials to the victims of the Lusitania at the Old Head of Kinsale and in the heart of Cobh’s Casement Square. 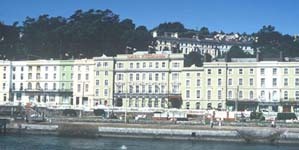 Cobh has been a popular destination for winter-weary British escapees since 1830. Europeans and British tourists come to enjoy the warm climate and scenic beauty of Southern Ireland’s coast and miles of sandy beaches. Sailing, fishing, swimming and sunbathing, and a variety of other water sports are offered. Cobh’s busiest months are in the summer, when the town plays host to South Ireland’s Pipe Band Championships (June), a famous regatta (August), and an international Angling Festival (September). Recognizing Cobh’s many offerings and unique history, the cruise industry has returned to Cork Harbor. The town abounds with wonderful restaurants, gift shops, museums, and at least a dozen traditional Irish pubs. 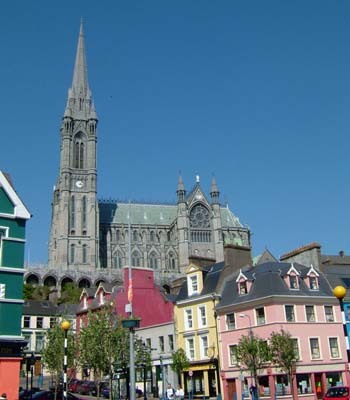 By air: Cobh is 20 minutes from Cork International Airport. By car: It’s 13 miles from Cork City on the N25. Take the main Waterford Road (N25) east. Exit at R624. By rail: There’s train service between Cork City and Cobh via Fota Island. It’s a 30-minute trip. By bus: daily service from Cork City to Cobh. From a pizza parlor, to lunch at the Titanic Restaurant & Bar, to fine dining at the award-winning Jacob’s Ladder, Cobh has a nice variety from which to choose. With the largest carillon in Ireland (47 bells), the chimes of St. Colman’s are reputedly the most beautiful in Ireland and can be heard for miles. The cathedral’s interior has beautiful gothic arches and delicate carvings which relate the story of the Catholic Church in Ireland from the time of St. Patrick. St. Colman’s is faced with blue granite, its floor is laid with mosaics, and it is supported inside by pillars made from local marble topped with intricately carved capitals. Carillon concerts are held frequently. 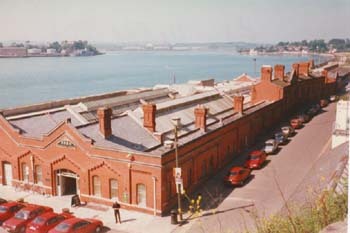 The Heritage Centre is housed in the old railroad station that was once the terminus for the millions of Irish boarding ships in Cobh. The museum also houses interesting displays about the Titanic and Lusitania. Not only is the story of Irish exodus told through a series of displays, there’s an audio-visual presentation and exhibits that recreate the sinkings of the Titanic and Lusitania, plus a restaurant, shop, and genealogical reference service. Available at the waterfront. A boat tour gives you a better perspective of the islands and shipping lanes in and around Cobh. Although it’s only an hour it’s educational and enjoyable. This 750-acre wildlife park is known for its arboretums, gardens, and the gorgeous Regency House. See Fota Island. Cork Ireland Tourism or The Irish Riviera.